Prairies, dry fields and hillsides; may spread along roadsides and railroads, and from prairie plantings beyond its native range. The recent record along I-75 in Cheboygan Co. is surely a non-native occurrence. 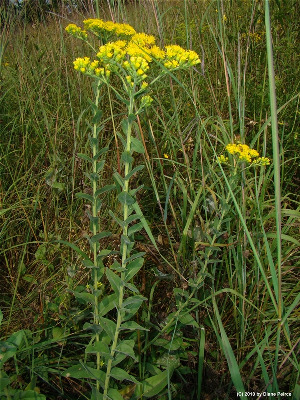 This is a tall, handsome, large-headed goldenrod. The blades of the lower cauline leaves, like the basal ones, are much larger than the upper cauline leaves, and instead of being sessile or nearly so are on long petioles. MICHIGAN FLORA ONLINE. A. A. Reznicek, E. G. Voss, & B. S. Walters. February 2011. University of Michigan. Web. April 21, 2019. https://michiganflora.net/species.aspx?id=466.